Henry’s career began with several brilliant failures. He abandoned a career in power engineering in 1899 to become chief engineer of the brand new Detroit Automobile Company. A year and a half later, the firm was in bankruptcy, having sold less than six of it’s automobiles. After the company failed, henry was hired as an experimental engineer by the men who had purchase the bankrupt company’s assets. In 1901, “because racing was supposed to tell something about the merits of an automobile,” he accepted a challenge by Alexander Winton, then the king of American racing. When the race resulted in victory for Ford and his car design, several of the former Detroit Automobile Company stockholders formed the Henry Ford Company. Henry was named chief engineer and received on -sixth of the stock in exchange for his car design. Friction developed almost immediately between Henry and the stockholders and He soon left the company. Although He was gaining fame through his racing cars, His dream was a comp[any of his own. But it was difficult to intrerest investors. Finally, mostly through the efforts of a Detroit coal dealer, Alexander Y. Malcomson, $28,000 was raised and the Ford motor Company incorporated in 1903. There were twelve original stockholders, including the famous Dodge brothers. Henry was made chief engineer and vice-president, and given 255 shares of stock in exchange for his automobile design and 17 patents on it’s mechanism. Most of the stock holders wanted to build big, heavy and expensive automobiles, with the market confind to a limited number of wealthy people, but farsighted Henry would not agree. “I’m going to build a car for the masses“, he stubbornly insisted. Production was started in a converted wagon factory on Mack Avenue, Detroit, in July, 1903. The first car was the early Model A. Manufacturing consisted mainly of assembling, since the running gear–engines, frames, transmissions and axles–as well as wheel, tires and bodies, were made by outside suppliers. 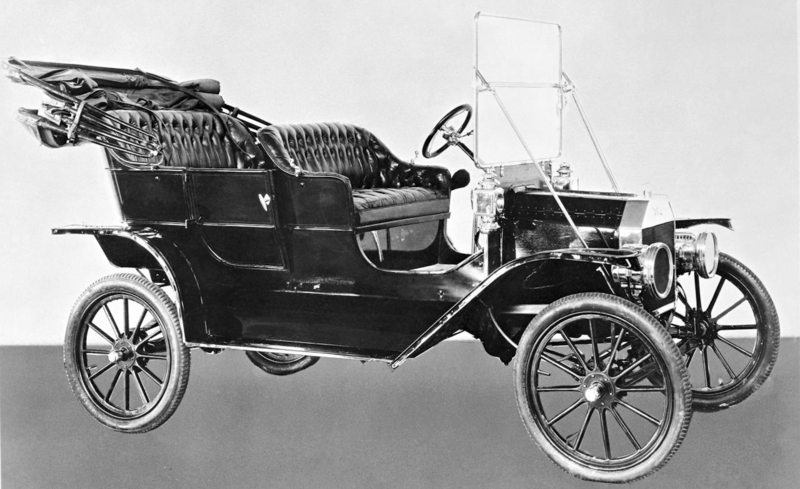 The early Model A had a 72-inch wheelbase and an over-all length of 99 inches. It weight 1,000 pounds. The engine was under the seat and the starting crank and steering wheel were on the right side of the car. The tonneau (back seat) detachable and slipped on and off from the rear. Entrance to the tonneau was through a rear door. The price was $750 for the runabout and buyers who wanted a tonneau paid $100 extra. A leather top could be bought for $50, or a rubber-lined canvas top could be had for $30. Seven other model followed, identified by alphabetical letters, and it is to be assumed that the missing letters represented duds. The Model K for instance was known to be a colossal failure–it was too expensive to build, the selling price too high and the market too limited. While these models were being marketed, however, Henry was hard at work on another four-cylinder car that was a considerable improvement over anything the company had yet produced. 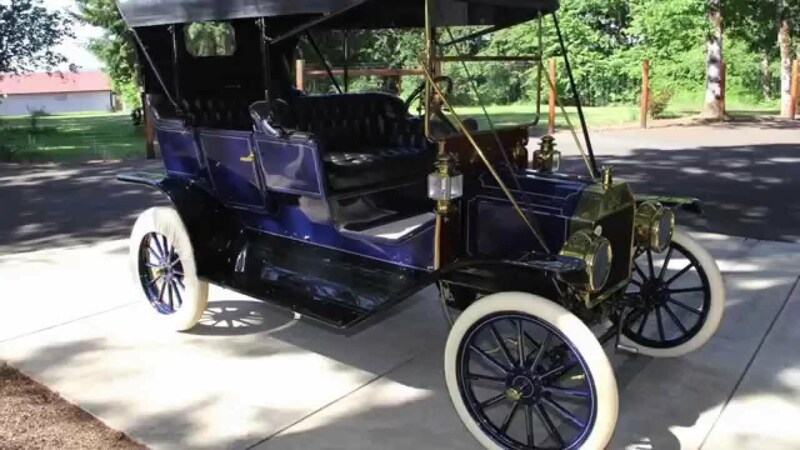 In 1908 he introduced the Model T (so called simply because it followed Model S) and it became the most famous of any automobile before os since. The name “Tin Lizzie” originated with the Model T. In those years a great many families employed a domestic who was a maid of all work during the week but come Sunday she strutted off to church in great dignity. These domestics were frequently named or referred to as “Liz” or “Lizzie.” Like Lizzie, the Model T was also a “maid of all work”–sometimes being used to grind fodder, churn butter, saw wood, or pull a plow in the fields–but come Sunday, she was prettied up to take the family regally to church. Everyone already referred to the Model T as a “tin car,” so “Tin Lizzie” was a natural. (Actually, far from being tin, the Model T bodies an fenders were of heavier gauge sheet metal than is used on most modern automobiles). Henry Ford had what he had always wanted in the Tin Lizzie–a car for the masses. “Let them have any color they want, ” he said in 1914 (in the interest of speeding up production), “so long as it’s black.” This decree was greeted incredulously by henry’s production chief, and three days later the man quit, convinced Ford’s decision would bankrupt the company. Production of the Model T had never been able to keep up with demand. Automobiles were still being built much as carpenters build a house: all materials were assembled in piles, the frames were placed on saw horses, and tre entire car assembled in one spot. Many men have claimed credit for the moving assembly line, but it is most probable that the idea evolved as a result of seral men’s thinking and experimenting. At any rate, the first attempt at a moving assembly line in the Ford company was in 1913, and by 1914 the Model T–from bare frame to completed automobile–could be produced in 93 minutes. After another serious disagreement with stockholders (including the Dodge brothers) which wound up in a law suit which he lost, Ford vowed never again to be dictated by stockholders, and thereupon, in 1919, using his entire capital and some borrowed money, Henry Ford bought out all other stockholders and the gigantic corporation came under the control of one man. The cost of buying all outstanding stock was $105,568,858. This amounted to a return of approximately $12,500,000 for each original $5,000 investment. Model T production reached fantastic levels during the ‘twenties. In 1923, a total of 2,011,125 Model T passenger cars and trucks were built–a record that was to stand for 32 years, until 1955. Basically, although some mechanical improvements had been added, the design of the Model T had not changed in nineteen years. But time had finally run out for the Model T and Henry reluctantly had to admit a new and better car must be built. Ford plants closed down for six months and re-tooled for what became the new Model A production continued through 1931, but once more, time ran out on the Ford car. Competition was crowding, and a new and better model was again called for. The “new and better car” was the V-8. It was a turning point for Ford Motor Company, and an example of the strange genius of Henry Ford. The four-cylinder car was efficient, and the V-8 was nothing more than two four-cylinder engines aligned together at an angle, and using a short, rigid crankshaft. Henry Ford knew that if he was to turn out Ford automobiles with the same speed he had turned out the Model T and Model A, the cylinder block would have to be cast en bloc (2 banks of 4 cylinders set at right angles to each other in one massive piece) just as his four-cylinder Model T had been. Experienced engineers and foundrymen insisted it could not be done. Henry Ford insisted it could. The day came when the problems were solved, and Henry Ford Company was the first automobile manufacturer in history to successfully mass produce such an engine. it was many years before competitors attempted V-8 production. Henry Ford was a leader in every sense of the word. Ford Motor Company built the first all-metal, tri-motor airplane ever used commercially in the United States; instituted the first commercial mail flight; perfected the first radio beam for guiding planes and then donated it to the nation. Henry Ford and his son Edsel established the Ford Foundation in 1936, and it is now the wealthiest philanthropic organization of it’s kind in America. Edsel Ford, Henry’s only son, who had been president of the company since 1919, died in 1943 in the midst of the war effort. His father, then 80 years old, resumed the presidency until his grandson, Henry ford II, was released from the Navy and returned home to take his place. Henry Ford died at his Fair lane estate in Dearborn, only a mile from where he had been born on April 7, 1947, at the age of 83. A hard-working man of simple tastes, he never lost his enthusiasm for square dancing and practical jokes. He remained active to the last day of his life, and although he never “left his home town, ” he became one of our most famous pioneering Americans.